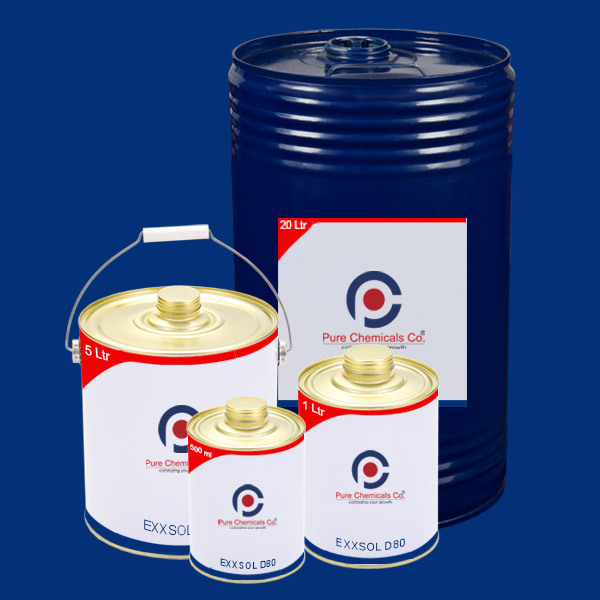 Exxsol D80 is an odourless liquid and an alipahatic hydrocarbon solvent; when you buy Exxsol D80 the major components in it are paraffins, isoparaffins and cycloparaffins with stray traces of aromatic hydrocarbons. Exxsol D80 uses are in paints, inks, agricultural chemicals and in aluminium rolling for food. You can buy Exxsol D80 online in India from ibuychemikals.com in varying quantities of 500 Ml, 1 Litre, 5 Litre & 20Ltr. The superior working of Exxsol D80 is used in metal working such as cutting oil, punching oil, stamping oil and rust prevention. Aluminium rolling applications use Exxsol D80 and FDA approves its usage as it is safe for contact with foods and pharmaceutical application. With such varied utilities, you can shop in retail and bulk quantities with just a click of a button from the leading Exxsol D135, D95, D80, Exxsol D60, and D40, seller. It is the perfectly designed alternative for MTO and white spirits from ExxonMobil.